If you’re looking for tips and activities to teach kids about money, you’ve come to the right place. Unlike most of my friends, we didn’t have a ton of disposable income when we were growing up, and my mother made me earn every single penny of my weekly allowance. From laundry and ironing, to vacuuming and scrubbing toilets, to preparing dinner and helping with the groceries, weekends and summer vacations were not a time for me to sit back and relax. There was always a list of jobs I needed to complete before I was able to talk on the phone or hang out with my friends, and while I found this highly irritating and unfair when I was a teenager, I do appreciate the time my parents took to teach me the value of hard work and the importance of planning and budgeting. It definitely served me well when I was a poor 20-something trying to make a name for myself in the corporate world! With that said, I’ve always questioned whether I was forced to take on too much independence and responsibility too soon. I have memories of my mother cutting sleepovers short when I was in grade 6 so I could spend my Sundays ironing my school uniforms, and I resented the fact that my summer afternoons were spent making beds, scrubbing toilets, dusting, and mopping while the rest of my friends were allowed to do whatever they pleased. It just didn’t seem fair. Of course, hindsight is always 20/20, and while I have no intentions of enforcing the same kind of expectations and responsibilities on my own daughter, I’m the first to admit I’ve done a crap job of teaching her about finances. I’ve fallen into the trap of wanting to give her more than I had growing up, and now that she’s getting older, I’m starting to realize I’m not exactly doing her any favors. So, I started researching tips to teach kids about money and I not only came up with some really great ideas, but I also found some spectacular activities to teach kids about money to boot! When I first started poking around online for basic tips to teach kids about money, I assumed most parents start to teach their kids about finances at a really young age, and was surprised to find the opposite to be true. Not only are parents neglecting to teach their kids money management skills, but schools aren’t doing a great job either, which doesn’t bode well for our children’s financial future. At What Age Should I Teach Kids About Money? If you think you don’t need to worry about teaching your kids about money until they become teens, think again. A lot of the literature I’ve read suggests parents should begin to teach kids about money when they’re about 4-years-old, and that an allowance can be successfully introduced as early as 6 years of age. Of course, the communication needs to be age-appropriate and will progress as your child gets older, but the sooner you start to teach kids about money, the more financially responsible they will become. Put savings in a clear jar. One of my favorite tips to teach kids about money is to replace their ornate piggy bank with a clear mason jar. This helps them visually see their savings grow over time, which can be extremely motivating. Demonstrate what things cost. We live in a day and age where we pay via debit or credit card for almost everything, and while we can all agree the convenience of these methods of payment are fantastic, they don’t do much to help us in our quest to teach kids about money. Wherever possible, make it a point to pay in cash so your child can better understand what things cost. This lesson is most effective when your child uses the money in his or her savings jar to pay for something as they can visually see the impact the purchase has on their savings. Be a good role model. If you want your child to grow up to be financially responsible, remember to model the same behavior yourself. Be deliberate with your purchases, and show your child the process you go through when weighing the pros and cons of your financial decisions. The more you get them involved, the sooner they will learn. Enforce daily and weekly chores. As I mentioned at the beginning of this post, I had a lot of household chores on my shoulders each week as a child, and while I was very hesitant to put a chore chart in place for my own daughter, I have learned that a little accountability can go a LONG way in the life of a child. CLICK HERE for a list of age appropriate chores and chore charts I love! Provide monetary rewards. Everyone seems to have their own opinion when it comes to giving their child an allowance. Some believe tying an allowance to chores provides motivation, teaches financial responsibility, and teaches kids the rewards of working hard, while others feel paying children an allowance in exchange for household chores teaches them that housework is an undesirable behavior. Whatever your take is on this debate, finding ways for your child to earn money regularly is a great way to teach them about finances. Provide additional money-making opportunities. Whether you choose to pay your child an allowance or not, finding additional ways your child can earn money throughout the week/month can go a long way to teach them about money. This could be as simple as helping out with seasonal chores like raking leaves and shovelling snow, or lending a helping hand while you’re cleaning out the garage, preparing a holiday meal for your extended family, or taking on more responsibility when another family member is sick or injured. There are always ways to get your child involved, and providing a little monetary compensation can go a long way. Teach the art of delayed gratification. Another great tip to teach kids about money is to enforce a one-day waiting period after your child sees something he or she wants to buy. This will provide you the opportunity to have some really great conversations with your child. You can help your child evaluate how much he or she has in his or her savings jar, how much the item costs, and how much will be leftover in an attempt to make him or her understand the implications the purchase will have on future spending opportunities. You can also help your child see that time can oftentimes remove the emotion from spending decisions, making us realize we’d prefer to save our money for a more worthwhile purchase. Set a budget. When your child reaches an age where he or she begins making purchases more frequently (i.e. buying lunch at school, going out to the movies with friends, etc. ), make it a habit to sit down together each week to create a budget. Show your child how to allocate his or her funds such that important purchases (food) are covered first, and help him or her see the importance of thinking ahead (and finding ways to earn additional money) to cover nice-to-haves (entertainment). Encourage saving. While my parents were great at teaching me how to set and stick to a budget, I didn’t learn the art of saving until I met my husband. Up until that point in time, I lived my life such that I spent every single cent of each of my pay checks, giving little thought to paying down my mortgage or credit card debt. He’s obviously the more financially responsible of the 2 of us – LOL – but I was amazed at how big a difference it made to automatically allocate a portion of my earnings to a savings account each month. Teach your child to put a small amount of his or her weekly allowance aside each week and, depending on your child’s age, find ways to appropriately reinvest the money. Younger kids may use their savings for a large purchase, while older kids can open a savings account and begin learning about compounding interest. This cash register was gifted to my daughter when she was about 3, and we got a LOT of use out of it. I highly recommend it! It’s a great tool to encourage imaginative play while simultaneously providing kids with opportunities to learn the basics about currency, math, and how to use a calculator. I love scavenger hunts as you can make them as simple or complex as you want using items you already have lying around the house. When it comes to using scavenger hunts to teach kids about money, there are so many options to consider. For example, you can grab a set of play money and hide a bunch of bills and coins around the house, detailing exactly how many of each your child has to find. Once everything has been found, ask your child to count it all out to tell you how much ‘money’ they found! Another option is to print/write different dollar amounts on separate pieces of paper (50 cents, $5, $10.50, etc.) and have your child find the exact amounts throughout your house with clues leading them to their treasure. If you’re looking for a basic set to begin the process of teaching your kids about money, this is a great option to consider. It includes play money to help you introduce what each coin and bill represents, as well as learning materials to teach beginner money skills, addition, and subtraction. I initially thought this activity would be too basic to teach kids about money, but I was wrong. I thought it was a sorting game, but it’s actually a brilliant and inexpensive way to teach kids how to count out money. All you need are some cupcake liners and a lot of coins and your child will be occupied for hours of fun! Designed to teach kids aged 7+ how to collect, count, and exchange money, this is a great board game to add to your family game night ideas! This is a great independent activity to teach kids about money either in the classroom or at home, and it’s free to download! Kids will learn coin identification while also putting their fine motor skills to work, and the coloring component makes this a great activity for bad weather days. In case you haven’t noticed, I have a ‘thing’ for Learning Resources activities and games. This set is perfect for ages 6+ and will teach important skills, like coin and bill recognition, how to set prices and buy and sell items, addition and subtraction, and how to make correct change. This is a great activity to put a child’s addition skills to the test as they figure out how to add the price of multiple items together. The task cards are free to download (I suggest laminating them) and can be used with real or play money depending on what you have available. In addition to Learning Resources toys and games, The Everything Kid’s books are a huge favorite of mine, and this one is no exception. This book will teach kids all about earning, saving, investing, and spending money, as well as important skills like online banking and how to open a bank account. This is by far one of my favorite activities to teach kids about money as it doubles as a great fine motor activity. All you need are some popsicle sticks, clothes pins, and coin stickers, and you can easily re-create this activity to use in the classroom or at home. I hope this collection of tips and activities to teach kids about money prove as useful to you as they have been to me! Remember to start teaching your kids about money at a young age, to be a good role model and provide money-making opportunities, and to help your child learn the art of budgeting and saving in fun and exciting ways wherever possible. 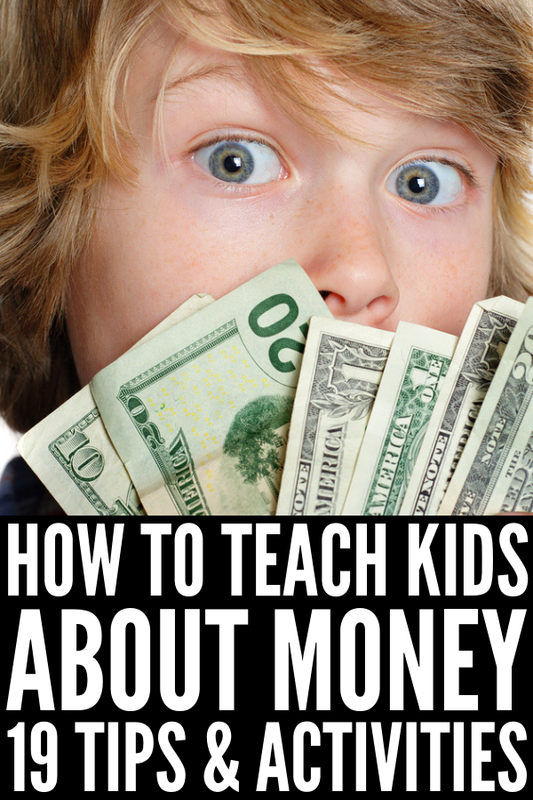 If you found these tips and activities to teach kids about money helpful, please share this post on Pinterest!